Please provide us with the following information and agree to the additional property specific terms and conditions! Don't forget to hit "submit" at bottom of form. *Pet fee of $125 or $250 (depends on property size) applies if you are bringing a dog. *If you bring a dog and it is NOT registered with us, you will incur an additional $500 fee. Landlord and Tenant agree to the following: Beachfront Only Vacation Rentals is permitting (1) well behaved dog on the premises noted above. Any damage caused by the pet will NOT be covered by the cleaning fee and will be the responsibility of the Tenant. The pet will be under Tenant's control at all times and will not pose a threat or apparent threat to the safety of other tenants, their guests, or other people on or near the rental premises. 1) Dogs are not permitted on the furniture unless you bring a dog blanket that protects the furniture from snags and dog hair. 2) Dogs absolutely must not be left alone unless crated. A frightened dog in a strange place may bark or become destructive. 3) Please check the grounds and the house to make sure you clean up after your dog. 4) Dogs are not permitted on the beach! For suggestions of dog-friendly places, please read our "useful information" section found on our website. If you decide not to bring a dog, we must be notified PRIOR to your stay, otherwise we will not be able to refund you. If you are unsure at this time, please just give us a general idea on how many adults and their age ranges. Please note that there is a maximum vehicle allowance for some rentals. Please see vehicle restriction section below for limits. Additional guests only. Do not include guests already staying at the vacation rental. There is no outside noise between 9pm and 8am. If a noise complaint is made, a fee of $1,000.00 will be assessed, and tenants may be asked to vacate property, with no refunds. For each neighboring Beachfront Only Guest that is disturbed, lessee will be responsible for covering any rental reimbursements for neighbors' stay, in addition to the $1000 fee. To be upheld and determined by the Police and or the Staff at Beachfront Only. There is no outside noise between 10pm and 8am. The property you have rented has a vehicle restriction. If this number of vehicles is exceeded, there will be a $1000 fee assessed. 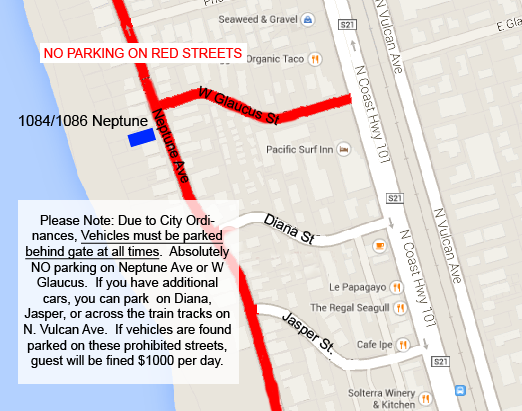 PLEASE NOTE: THERE IS NO OVERNIGHT STREET PARKING IN THIS NEIGHBORHOOD FOR VACATION RENTERS. Please be sure to use provided driveway and/or garage. The property you have rented has a vehicle restriction, with a MAXIMUM of 3 VEHICLES. All vehicles must be in the driveway behind the gate at all times. 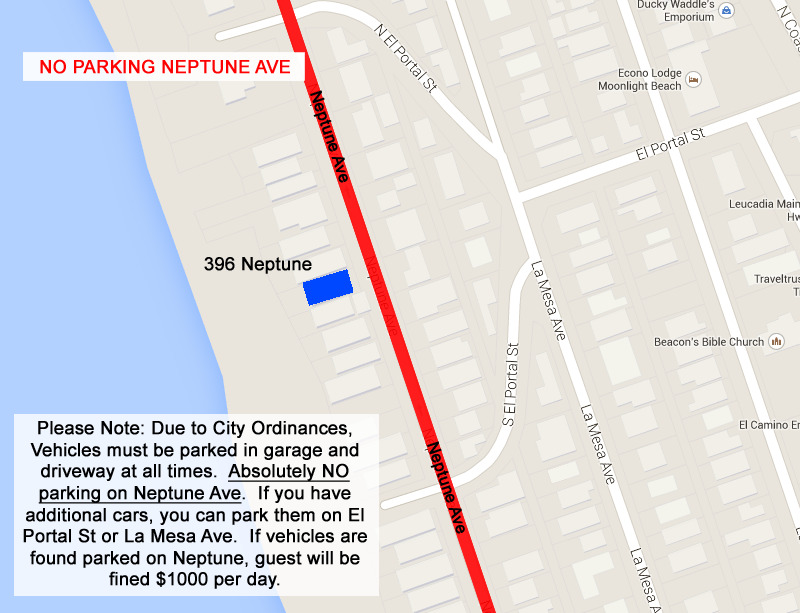 If these cars are found parked on Neptune Ave. or Glaucus, there will be a $1000 fee per day charged to the guest. The property you have rented has a vehicle restriction, with a MAXIMUM of 2 VEHICLES. Please note that the City of Oceanside prohibits vehicles from parking in the driveway of this unit, as it blocks the pedestrian sidewalk. If your vehicle is parked in the driveway and is blocking the sidewalk, your car may be towed. Please pull cars into the garage and if more space is needed, park on the street. This disclaimer applies to the property located at 1220 Neptune Ave. Tenant acknowledges that there is construction going on at the neighboring property. The construction hours, noise, etc are completely out of Beachfront Only's control. It may or may not be disruptive to the tenant's stay. BY ACKNOWLEDGING BELOW, I AGREE TO THE ABOVE STATEMENT, AND WILL NOT HOLD BEACHFRONT ONLY VACATION RENTALS RESPONSIBLE FOR ANY CONSTRUCTION NOISE OR DISTURBANCES. NO - Please Cancel my reservation or help me find another location. This disclaimer applies to the property located at 5185 Shore Drive. Tenant acknowledges that there may be construction going on at neighboring property. The construction hours, noise, etc are completely out of Beachfront Only's control. It may or may not be disruptive to the tenant's stay. 3) I, for myself and on behalf of my heirs, assigns, personal representatives and next of kin, HEREBY RELEASE AND HOLD HARMLESS the Owners of 5185 Shore Dr. Carlsbad, CA 92008, and Beach Front Only (RELEASEES), their officers, officials, agents, and/or employees, WITH RESPECT TO ANY AND ALL INJURY, DISABILITY, DEATH, or loss or damage of any kind whatsoever, to person or property, WHETHER ARISING FROM THE NEGLIGENCE OF THE RELEASEES OR OTHERWISE, to the fullest extent permitted by law. BY SIGNING AT THE BOTTOM OF THIS FORM, I HAVE READ THIS RELEASE OF LIABILITY AND ASSUMPTION OF RISK AGREEMENT, FULLY UNDERSTAND ITS TERMS, UNDERSTAND THAT I HAVE GIVEN UP SUBSTANTIAL RIGHTS BY SIGNING IT, AND SIGN IT FREELY AND VOLUNTARILY WITHOUT ANY INDUCEMENT. By signing below, I verify that all information on this registration form is accurate and that I agree to the restrictions and regulations above. I understand that if If any information received on this registration form is found to be fraudulent or a violation to the Terms and Conditions, Beachfront Only has the right to revoke the reservation and keep any monies collected. If you need to cancel more than 60 days before your arrival, the 10% deposit will not be refunded, all other monies will be refunded. If you need to cancel more than 30 days but less than 60 days before arrival, you will receive half of the TOTAL cost of your stay. Monies are non-refundable if cancellation is less than 30 days before arrival date. We always recommend Travel Insurance for peace of mind. All Cancellations must be submitted in writing. For date or property changes between 0 and 60 days of arrival, there will be a $100 transfer fee, unless the dates or property change is an upgrade. For changes within 30 days, changes must be approved by Beachfront Only and are not guaranteed.